Full custom printed options available. The UpSheGoes Gazebo from GazeboNZ is not your run of the mill cheap Gazebo commonly sold. It is built to last. Many Gazebos have cheap powder coated lightweight frames. Not the UpSheGoes Gazebo. The heavy duty 50mm Aluminium frame will not rust, bend or buckle. 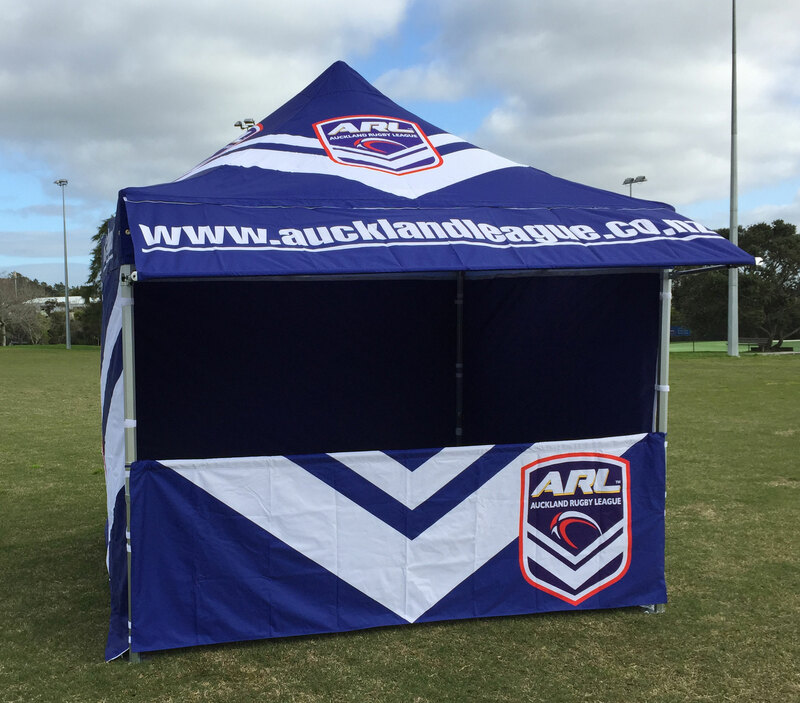 Perfect for long-term Gazebo use, such as schools, sports clubs, businesses, trade show exhibitors, or even for semi-permanent home use. Our UpSheGoes Gazebo roof and wall materials are 100% seam sealed, waterproof and flame resistant. They are also rated at 50+ UPF (Ultraviolet protection factor) as standard so you'll be protected from both rain and shine! Choose between the tough 420D or the even tougher 1000D polyester canopy with optional walls and door addons. You can buy a couple of Gazebos and link these together using the optional gutter accessory. Or customize your gazebo with fully printed, roof and wall canopies. Stand out from the rest! Our 10 year peace of mind frame warranty. Our 3x3 heavy duty Gazebo is by far our most popular. Used by market stall holders and event committees alike, the UpSheGoes 3x3 Gazebo will popup quickly and is perfect for general use both long and short term. Easily erected by 1 person in under 3 minutes. This gazebo is ideal for most applications. The family sized option! 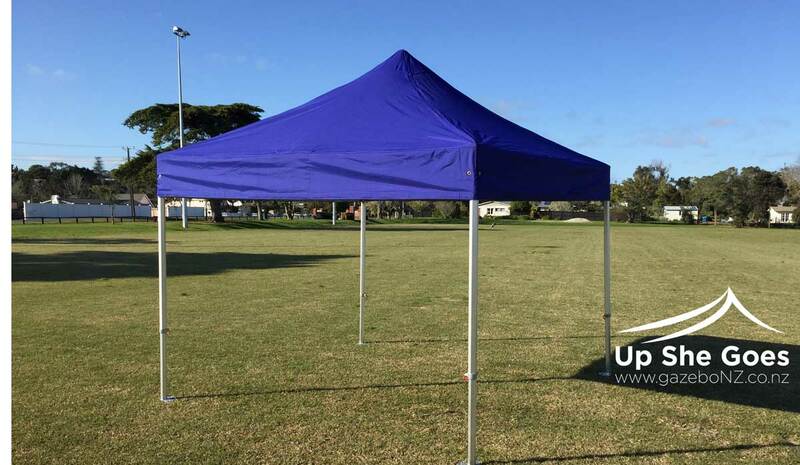 The 3X4.5 UpSheGoes Gazebo from GazeboNZ can be used for anything from that school sports day or a trip to the beach! With the added option of wall canopies block that chilly wind and keep that sand out of your picnic. Typically used by larger market stall or vehicle enthusiasts for that larger sheltered space to work from. These larger size Gazebos are still an ezy-up style and will popup quickly to provide that space you need for a function or event. These Gazebos are able to be linked with the use of gutter accessories to provide a longer venue suitable for parties and weddings. There is not much difference in the price to buy compared to what you might pay to hire.